Heading for an NFL game or England football match at Wembley? Going to watch a Premier league game at Vicarage Road? Yes Watford are currently a premier league team. Heading to the Watford area for a friends wedding or a party? Visiting the nearby Warner Bros Studio for a bit of Harry Pottering? (With Watford so conveniently located close to London, it really is a great stopover point.) Well if you are then may I recommend that if you're thirsty and a little peckish, then a stop in the new cafe, Joe and the Juice in Watford's Intu shopping centre will be the perfect place to do so. Sketches has a new cafe review. Head Intu Watford, no really its the name of the shopping centre. And tucked among the brand name shops of John Lewis and WH Smith on the ground floor, you'll find the cafe Joe and the Juice. 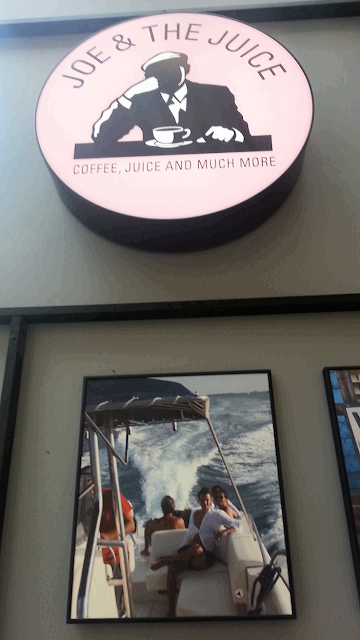 Fancy a coffee or a freshly made juice drink then you've picked the perfect spot. Because its an open cafe in a shopping centre you don't get the homely feel of a stand alone cafe, even though the seats are comfortable and its surrounded by small walls. What you will get is good coffee and a menu full of wonderful juice drinks. Too many to mention here. As usual when I try out a new cafe its always a latte. Seems to be the benchmark for whether its a good cafe or not. In my book at least. They have a number of sizes to choose from, so I plumped for the 12oz (Yellow Cup). As the picture shows it was lovingly made, creamy and not overpowering in coffee flavour. Basically the perfect mix and balance. And the cups have a certain charm. I like the different colours for different sizes. The juices were prepared with the same attention to detail and although the food menu looked small it seemed more than adequate. The cafe is spacious with plenty of small tables as well as stools and benches for the individual users. 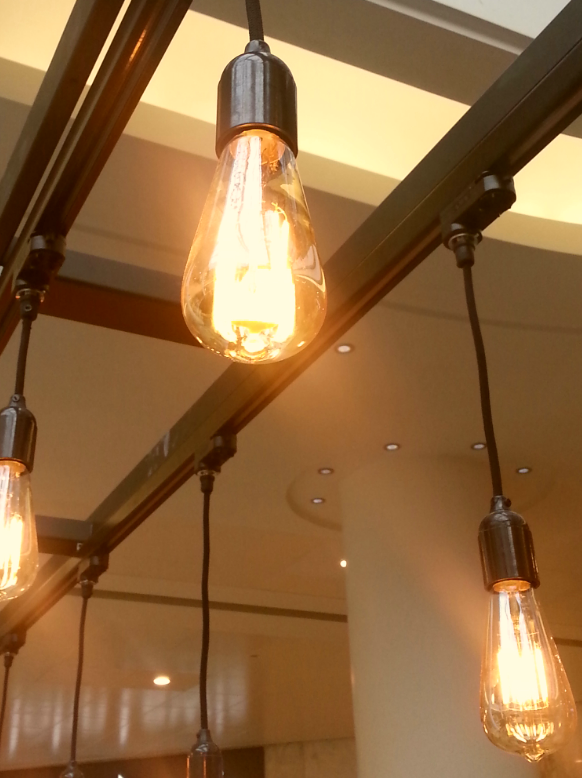 It has a nice ambiance and the decor is not over powering, almost too dark toned. The hanging lights add a bit of colour. Although Joe and the Juice are not an independent cafe. They seem to have branches across the globe from Korea to the US, its still a welcome addition from the more established chains that seem to be on every street corner. Add in the juice factor and food and you have a winning combination. If there is a little gripe then it would be the waiting system they have. When its not busy then calling out individuals names works well, but if busy it's a little time consuming and frustrating. That though is a very minor niggle. Overall this is a great cafe and a welcome addition to the Watford cafe scene. 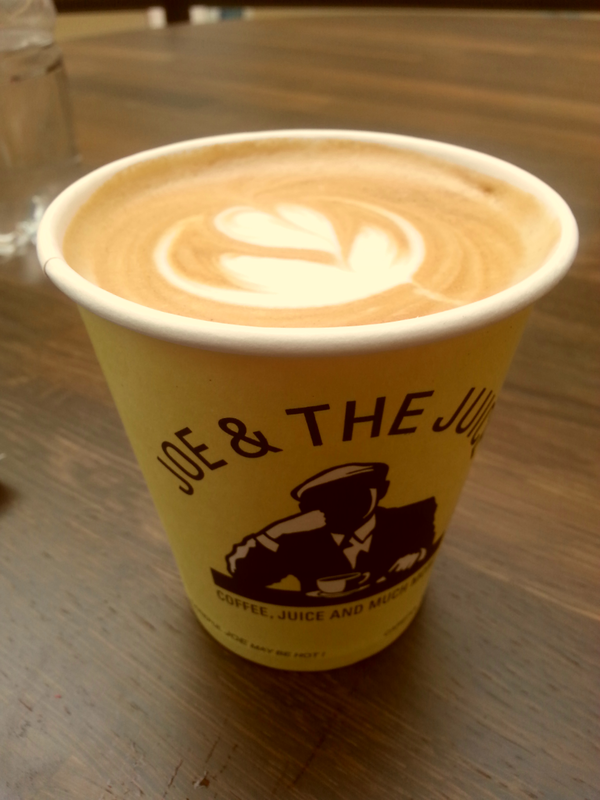 Joe and the Juice are a good option in a crowded cafe market place. Have you been to a Joe and the Juice? What's your opinion of them? Why not drop us a line through the various network channels.